"Fear is the suppressed excitement of life." My life is a constant search for meaning. Each day I am a bit more focused, clearer in my intentions and more intense in my search for stuff that matters. I am less and less satisfied with surface conversations, meaningless projects and wasted time. I am unfulfilled when I cannot find some truth, some morsel, that reverberates within my soul and makes me feel more whole. Hiking always holds meaning for me. After a hike, I let the dust settle and then I write a hike report. In that process, the message held in the hiking experience reveals itself. It is an "aha" moment filled with amazement at how life is all connected. Hiking helps me discover who I am. Hiking is healing me. Often the healing comes through the challenge of hiking in the elements, the freezing cold, driving rain, ice on the trail, or deep snow. Or the healing comes as a result of the physical difficulty of the hike, muscles screaming along a long steep root and boulder-infested trail. Or the healing comes from facing my fears, like walking laterally along a smooth, almost 90-degree rockslide. Being thrust out of my comfort zone is always good for a learning experience. But our Hamlin hike is about being IN my comfort zone. It shows me how far I have come. 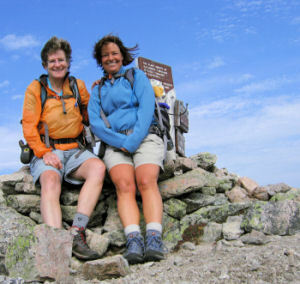 Pat and I hiked Katahdin a little over a year ago. It was a complete and utter out-of-my-comfort-zone experience. 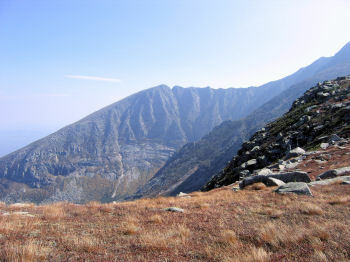 Climbing up to Pamola Peak, I felt like I had already climbed an entire mountain when I looked up and saw that I had another mountain to climb to get to the summit. The perspective of distance took me by surprise and put an uncomfortable edge in my stomach and a catch in my breath. Then Knife Edge. The Chimneys, literally straight down then back up, sent me reeling with fear. Knife Edge, swirling with clouds that obscured our view, cold wind blowing so hard I had to hunker down on the sharp serrated rocks, I prayed for the end at Baxter Peak. It took 2 hours and 10 minutes to navigate along the Knife Edge's 1.1 mile. Then we started down the slide on the Saddle Trail and the rains came. This trail unnerved me. I was cold and frightened in the rain and wind. I had not had a lot of experience with slides and the steepness and wet moving rock sent my heart into my throat. I was out of my comfort zone from the tree line on Pamola to the tree line coming down Baxter. A year later, hiking up Katahdin again, this time heading for Hamlin Peak, is a totally different story. We hike up the Chimney Pond Trail, loving the fall colors and letting our amazement at the beauty of nature ooze out of us, snapping pictures at every bend in the trail. We reach tree line and are immediately taken by the dark foreboding skies. It looks like rain above the mountain summit, but sun is peeking out from the clouds behind us illuminating the trail and making the red, green and gold groundcover brilliant directly in front of us. The sight of Knife Edge, a long bumpy sharp ridge connecting Pamola Peak to Baxter Peak, takes us aback. Last year on our hike down, the low clouds and rain obscured the view. But here it is in all its glory. We are amazed at its grandeur and impressed with our feat of a year ago. Hiking up Hamlin reminds me of hiking Pamola. The trail above tree line seems to stretch on forever. The summit looks so far away and we think there is a person on the summit and he is so tiny. But the sight does not overwhelm me. I am excited to be out in the open, in the midst of the incredible scenery, loving how it changes as we progress up the mountain, fascinated by the perspective of distance as we inch closer to the summit. I never feel like I will not make it or gasp at the sight of the never-ending trail. I do not even dread the rain. If it comes, it comes! We reach Hamlin summit and are immediately blown away by both the wind and the incredible beauty of the Tablelands. Rust and reds and burgundy grasses, yellow and gold leaves smattered with green, blowing over granite rock, brightened by clear sunlight amidst light blue skies. The grasses form an undulating surface in the wind, the summit is alive. 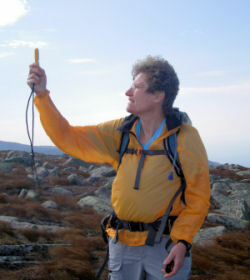 As we walk across the Tablelands, the wind increases and Pat takes out her wind gauge. When a fierce wind gust comes, she holds the dial up high facing the wind and together we watch the numbers go up one by one. We start to cheer for a higher number, like auctioneers - we have 40 com'on, 41, 41. Whoooo Hoooo 43! Com'on 44, 44! Oh 45! 46! 47! Whooo hoooo! We are laughing, loving every minute of the winds roar and force as it tries to push us back along the Tablelands. Last year on Knife Edge, the winds scared me to death. 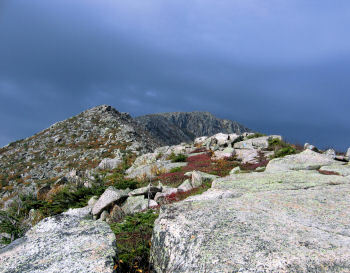 And since then we had a few hikes above tree line in the Presidentials where the winds have been incredibly fierce and I have left the mountains frightened. I remember meeting a White Mountain rescuer on top of Madison. I shared with him that the winds scared me and he said, "Play with them." I remember thinking, " What the heck is he talking about?" He was talking about Pat and I cheering, holding the wind gage up, screaming above the wind's howl for another big gust to push the gauge higher. The biggest gust we record is 55 mph. On the Beaufort Wind Force Scale, 55-63 mph winds is called gale force / storm warning where trees are up-rooted and there is considerable structural damage. On the Tablelands, barely able to hold ourselves up, we laugh and experience and play and measure and live the moment. Reluctant to leave the beauty, sun and thrill of the wind, we finally head down the Saddle Trail. Having encountered my fair share of slides over the past year, today I am completely comfortable carefully lowering myself down one sliding rock at a time. Not one moment out of my comfort zone, I'm loving the beauty and breathing in each view as we descend. I am grateful for the opportunity to be back on Katahdin, doing it again, as a more experienced, stronger hiker. We reach Chimney Pond and hike the last three miles out of the woods, still excited by what we have seen and experienced on top of Katahdin. It was exhilarating, thrilling, immensely beautiful, fierce, and challenging and we were up to the task. Every moment I was empowered to see and feel and love the wind, the foliage, the sun light and the endless ridge above tree line. My experiences on the mountains have changed me. I have pushed the edges of my envelope and it is bigger now. I have been on the fringe of my comfort zone and, by so doing, it has expanded out, widening my playing field and encompassing more. And in that growth, there is gratitude, and appreciation and respect for the strength and beauty of nature. I have less expectations hiking, less apprehension and more confidence that I can handle whatever comes. And I know I will find meaning. On Katahdin, my fear turned to joy.